I spotted these a few days ago and can’t get them off my mind. There’s got to be a supplier in the US…does anyone know where one can find something like this? I'll ask my dad. I have not seen a Ford tractor like that one, but my dad and sister both have purchased ones similar that were John Deere. I believe they got them at a John Deere dealership. They hold up great. My nephew has a trailer to go with his and he hauls all sorts of stuff with it. My sister said that he even used it to move a big pile of dirt from a neighbors yard to their yard (the moving of said dirt had already been discussed and agreed upon by the parents). As for the car, my dad has a couple of those as well. One is a tow truck and the other is a bright yellow car. I do not know where those were purchased. I can ask. So, the answer is YES, there are distributors in the US. Not unsurprisingly, I saw these last week at the gift shop at the Henry Ford Museum in Dearborn, MI (a *wonderful* place for kids, and fascinating for adults too). Perhaps you could call and check with them... Adorable! I've seen them around here for sale so I know they are available. They are SO cute too! How large are these? Its hard to tell. 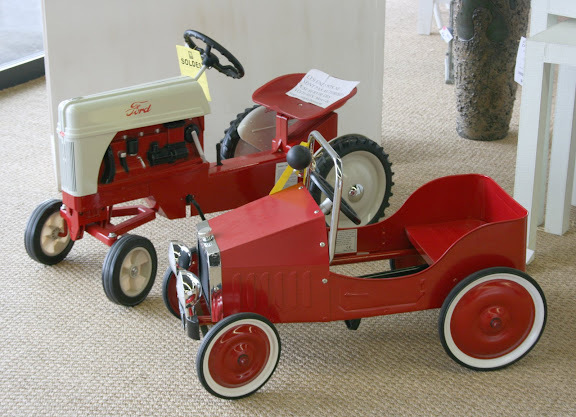 Could a child ride in them or are they more like a model truck?